For Unhas, the year 2017 is filled with hopes that is coincided with obstacles. 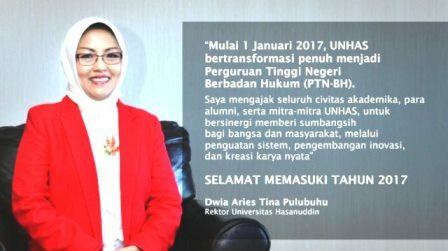 Such a matter can be attributed to the fact that starting 1 January 2017, Universitas Hasanuddin will officially become an Autonomous University (PTNBH). It is in reality applied in 2016, in which Unhas maintained trials on the PTNBH system, which has been authorized also to 11 other higher education institutions in Indonesia. “The PTNBH systems has been in reality adopted slowly since 2016, with the required necessities completed one by one,” stated Unhas Rector Prof. Dwia Aries Tina Pulubuhu, MA., Monday (2/1). Dwia recognized, that during the trials of the Autonomous system adopted, many obstacles were faced. “It is in fact a new system, therefore issues are inevitable. But that itself is transformed being a challenge for advancing and developing the institution,” she stated. In regards to the official implementation of the Autonomous Status, Unhas Rector asked for all academic elements, alumni, and Unhas partners to in synergy, build the state and people. “Such a noble contribution can take place through solidifications, development of innovation, and creativity,” she elaborated. As a result of the Autonomous Status embraced, Unhas is able to manage their institutional budgets, through a more autonomous finance management. The status further gives the institution the freedom of determining policies that are aligned with the needs of the institution, without having to wait for the administrative decision of the central authorities. Unhas further have the power to develop their assets independently in order to progress their performance and assist the conducts of the university. Though given such a higher authority through the PTNBH, Unhas rector guarantees that there will not be any commercialization that takes place in Unhas. “Welcome to 2017 for all academic elements, alumni, and partners of Unhas,” closed the Unhas Rector.